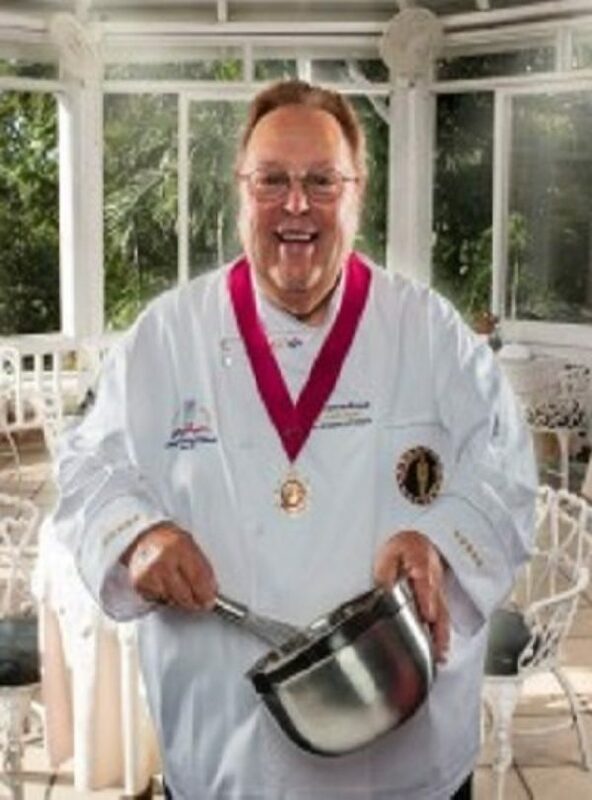 Fritz Sonnenschmidt is a Certified Master chef (ACF) and a Global Master Chef (WACCS), in 2006 he was appointed Heritage Professor of the Culinary Institute of America. Author/Editor of The professional Chefs Art of Gardemanger, Dinning with Sherlock Holmes, The American Harvest, Taste and Tales of a Chef, Stories and Recipes, and Charcuterie Sausages/Pates/Accompaniments. As well as a television personality, appearing on PBS in six seasons of cooking secrets of the CIA and five seasons of Grilling Maestros. His lectures and cooking Demonstrations are immensely popular especially on culinary basic fundamentals, cooking and Sausage making. Fritz started his culinary career with an apprenticeship in Munich, Germany, which lead to extensive international work experiences in hotel and club kitchen, including as Executive Chef at the Sheraton hotel New York City. In 1968 he joined the Culinary Institute of America where he taught Gardemanger and International Cuisine and he retired as culinary Dean in 2002. He was the past National Chair of the American Academy of Chef, the honor society of the American Culinary Federation. Fritz is a repeated gold medalist at the IKA Culinary Olympics and other international Food Competitions, including receiving the Jerusalem Gold Medal 1977 for excellence in kosher food and the Geneva Gold medal in cold food display. Fritz is one of the most recognized chefs among his peers and was voted into the American Academy of Chefs Culinary Hall of Fame. In 2009 he received the AAC Live Time Achievement Award. Past National Chair American Academy of Chefs (4 years). He is a member of the Baker Street Irregulars (Sherlock Holmes) and holder of “The Shilling”, 2 Shilling and Half a crown “award. His latest book Charcuterie, Sausages/Pates/accompaniments. Delmar/Cengage teaches the easy way making Sausages, Hams and Salamis, Taste and Tales, recipes and stories is a must to read, published by Apprentice Hall. At present he is finishing His latest Book “Mostly Meat less Cooking”. He is also a Partner with “Master Chefs Institute LLC”, a research and food evaluating Company. ( www.masterchefs-llc.com) and he is happily married to Debbie Prislopski for 25 years.